How can cosmetic dentistry improve the appearance of your smile and enhance the health of your teeth and gums? Cosmetic dentistry combines artistic restoration techniques with advanced dental health strategies to establish and maintain your most natural, beautiful smile. If you have ever dreamed of showing off a healthier, more attractive smile, AACD-accredited, LVI-trained cosmetic dentist Dr. Ted Murray can turn those dreams into reality using the most current cosmetic dentistry techniques and technology available today. He works as a team with his daughter, Dr. Berning, who is also receiving LVI training. For a discussion of your treatment options and an evaluation of your smile, please call Exceptional Dentistry at 563-556-2711 today. Dr. Murray, Dr. Berning, and Dr. Oetken serve patients in and around Davenport, Cedar Rapids and other nearby communities from our office in Dubuque, Iowa. Tooth whitening can take years off your appearance. At Exceptional Dentistry, the safe and effective ZOOM! In-Office Whitening System can dramatically brighten your smile in under one hour. ZOOM! Whitening is the perfect choice for busy individuals who want to enjoy a more youthful appearance without spending hours in the dentist’s chair. Invisalign® straightens teeth invisibly, without the discomfort or awkward appearance of conventional metal braces. We use advanced 3D computer imaging to create your treatment plan. A series of clear, custom-made, comfortable aligners can gently realign your teeth over time for a straight, stunning smile. In two short, pain-free visits, Dr. Ted Murray, Dr. Kristen Berning, and Dr. Alexia Oetken can restore the appearance of your smile with porcelain veneers. They are thin shells of fired porcelain that fit perfectly over your teeth, effectively correcting almost any smile imperfection. Porcelain veneers remain strong, attractive and durable for years. If your smile reveals excessive gum tissue, making your teeth appear short and unattractive, you may be a candidate for laser gum recontouring. This is a safe, comfortable procedure that gently reshapes and sculpts the gum line for a more natural and beautiful smile. 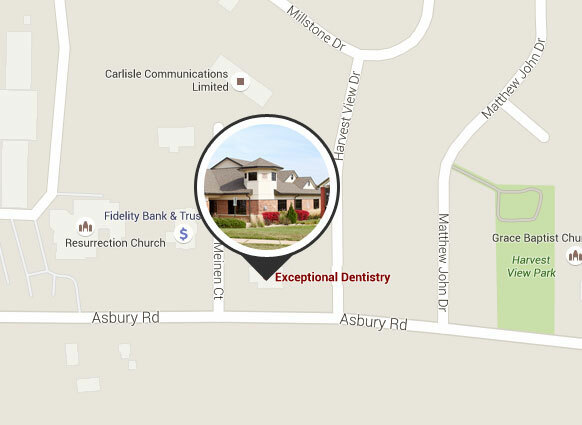 Exceptional Dentistry offers metal-free restorations. Silver mercury fillings and amalgams can eventually weaken and break teeth, causing further decay. Metal-free fillings are safer and stronger and look so similar to your tooth enamel that they are undetectable as fillings. No matter what your cosmetic dentistry needs are, we can help you achieve your healthiest, most stunning smile. To learn just how wonderful you can look and feel, please call 563-556-2711 or email our cosmetic dentistry office for a personal consultation. We serve Galena, IL, as well as Dubuque,Dyersville and Davenport, Iowa. "Thank you for the outstanding care you have given me and my family. I believe that you truly saved my teeth and my smile with the restorative work that you did. I can't say enough about how confident Eric and I are in our smiles. That confidence spills over to many other areas of our lives."